Farmed Barramundi (Lates calcarifer) of all sizes display blue-grey discolouration of fillet flesh, particularly on the area dorsal of the spine. Intensity of the colour varies from slight to deeper levels of grey. Marketing/retail experts agree that this colouration is reducing the appeal of the raw farmed Barramundi fillet on display to consumers, hence impacting on Barramundi sales in the retail sector. 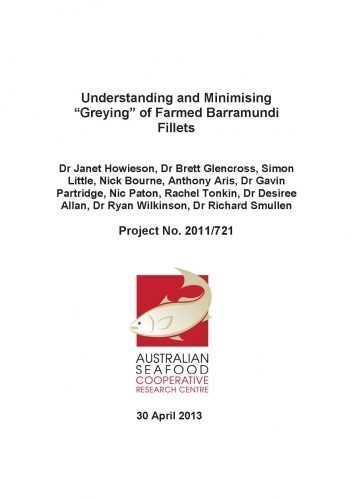 Hence it suggested that identifying and rectifying the cause of the fillet colour will dramatically increase retail sales of Australian farmed Barramundi fillets. Although generally the grey disappears on cooking, occasionally the grey colouration may form as black lines on cooked product resulting in a reduced confidence from the food service sector. Hence reducing the appearance of the greying through the supply chain (including cooking) for Barramundi would be an important step towards greater market acceptance of farmed Barramundi. This project found proof that the greying is caused by melanin, and was able to qualitatively identify the extent of the problem in farmed and wild fish. It also achieved the identification of the influence of incident light, background colour and a range of dietary factors on skin and fillet melanisation. Pre-harvest fasting can reduce the incidence of ‘greying’ and also significantly impact the texture of farmed Barramundi. Harvest method has little influence on fillet melanisation, but can impact on other quality parameters such as texture, and quality index. It has also shown that feeding ‘natural’ feed does not result in less greying (despite the observation that wild Barramundi have no or very little greying).